Octane boosters are used to help prevent engine knock/pinging/detonation in vehicles that require fuel with a high octane rating. While they do not provide additional power, octane boosters can be critical in preserving the integrity of the engine components. Four of the best octane boosters are discussed below, along with common engine problems and symptoms of low-octane fuel. 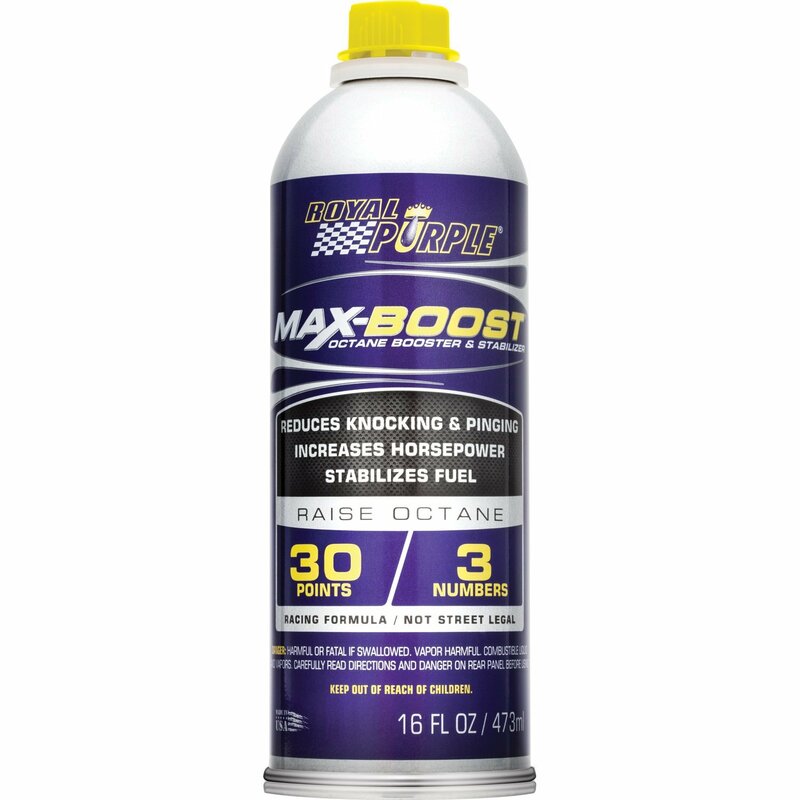 The Max-Boost octane booster by Royal Purple has the ability to raise the octane rating by 30 points. Reviewers mentioned on the extra “punch” this product gives their vehicles. With Max-Boost, you will not need to add any extra lead additives for the protection of your non-hardened valve seats. This product can also help remove deposits from your fuel injectors and reduce power loss caused by knock-retard in computer-controlled vehicles. Engine knocking/pinging and unstable fuel can be remedied with the use of this high-quality octane booster. Engine knock is one of the most disturbing problems you will experience with your vehicle. Engine knock is also known as pinging, detonation and spark knock and is caused by an incorrect air/fuel mixture. The fuel injected into the cylinders is designed to burn in short bursts or “pockets” as opposed to a single giant fireball. As each pocket burns, a shock occurs that permits the next pocket to burn until that stroke of the engine is complete. When engine knock occurs, the pockets burn unevenly and create shock waves at irregular intervals. If left unremediated, these irregular shock waves can cause damage to the cylinder housing the piston and the piston itself. Engine knock can be caused by several things. These include incorrect spark plugs, carbon deposits on cylinder walls and an inadequate fuel octane rating. There are others, but these are the most common (and the cheapest to fix). Spark plugs are recommended by individual manufacturers for the model and make of vehicles they produce. If your vehicle is equipped with a different product than suggested, you may experience engine knock. The heat range of a spark plug defines the safe temperature at which it is designed to run. Besides creating a spark to fire the engine, spark plugs also withdraw heat from the combustion chamber and into the cylinder heads. If you have tried altering your fuel and still have engine knock, consider checking your spark plugs. U.S. fuels are all required to have a certain amount of carbon cleaning detergent as part of their constitution. Despite the addition of this detergent, carbon deposits may still form. Deposits decrease the volume that the cylinder can hold, leading to a higher compression ratio and engine knock. To repair this problem, you can try a detergent additive from an auto parts store. In extreme cases, you may want to add detergent at every fill-up of your fuel tank. The octane rating of a fuel is occasionally referred to as the anti-knock index (AKI). The AKI of your vehicle is specified by the manufacturer. 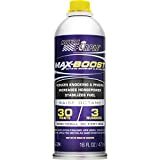 If your gas has an inadequate AKI, try an octane booster such as Royal Purple’s Max-Boost. If you are still having trouble, you can try a different type of gasoline. Using a fuel with an AKI higher than that recommended by the manufacturer is necessary for some vehicles. Does a Higher Octane Rating Actually Increase Gas Mileage? The short answer to this question is no. The octane rating of your fuel is simply a measure of the energy required to actually ignite fuel, not how much energy is provided. There are a few exceptions to the rule, such as when your vehicle requires high-octane fuel to perform properly. Octane is merely a measure of how well the fuel resists engine knock. A pure hydrocarbon fuel would have an octane index rating of 100 percent. However, because gasoline is made up of many different hydrocarbons, the octane rating is a comparison of the anti-knock properties of the blend in relation to the anti-knock properties of a pure hydrocarbon. Because of certain fuel additives, aircraft and racing fuels have an octane index rating greater than 100. In order to measure octane, the engine is tested under two different conditions. The first method (R) involves the testing of the fuel for its anti-knock characteristics when the engine is under load. The second test (M) measures anti-knock tendencies when the engine is not carrying a load. The average of these two tests is shown on the fuel pump as the gas station (ex. R + M/2). All fuel in the United States must meet a minimum octane rating of 87 percent. More efficient blends have a rating of 88 percent to 90 percent. Ratings higher than 91 percent receive a “premium” rating. By law, premium gas must be at or above 91 percent to bear the title. At some gas stations, you may see 93 percent ultra-premium fuels. The Lucas octane booster is safe for turbocharged engines, oxygen sensors and catalytic converters. If you have a fuel-injected or a carbureted engine, no worries! Lucas is also safe for these engines. 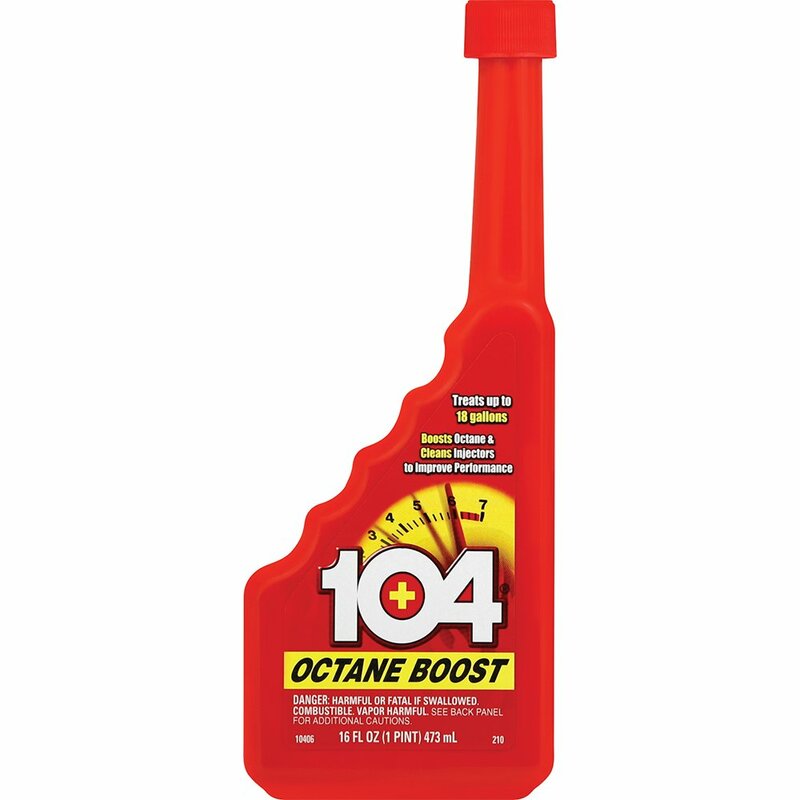 Reviewers mentioned that the this octane booster can make your vehicle feel stronger in torque with low RPMs. Be forewarned that this product has a tendency to cause build-up in the injectors and valves, so keep a bottle of detergent on hand. Some people use this product along with premium fuel if the premium fuel alone is not sufficient to prevent engine knock. Modern computer-controlled vehicles with fuel injection are constantly being monitored by the computer. Necessary adjustments are made in timing and fuel air mixture to compensate for engine knock. Many of these late-model engines have a sonic knock sensor installed in the cylinder block to help maintain engine stability. Older models are more sensitive to low octane levels in fuel as a result of old point distributors and early engine ignition systems. Because exhaust gas recirculation systems were only in their nascent stages of existence when these older cars were manufactured, they were not as efficient as modern systems. As a result, they have a tendency to contribute to engine knock. Because high-octane gas burns slower than low-octane gas, it is more resistant to engine knock when high RPMs and cylinder pressures come into play. Compression ratios also contribute pressure build-up in the engine cylinders. High compression ratios can lead to high cylinder pressures, which in turn can predispose an engine to pre-detonation. Unless specified by the manufacturer, most modern vehicles will not require a high-octane fuel. Some high-performance engines are built with higher compression ratings or with high RPM camshafts and will require 91 octane fuel as a result. However, the average engine will do just fine with the cheaper blends. Ethanol is added to gasoline to enhance its quality. The fuel is made from renewable biological sources like switchgrass, grains and corn. Blended at a 10 percent ratio, ethanol can increase the octane rating of the fuel by as much as three points. Tailpipe emissions can be reduced by the addition of ethanol in your automotive gasoline. Ethanol fuel is technically ethyl alcohol and has the ability to absorb water. Because alcohol has the ability to absorb water, it is commonly found in products that remove water from fuel. Water reduction will help reduce the chance for frozen fuel lines in wintertime as well as permit naturally occurring condensation to burn cleanly in the combustion chamber. Ethanol fuel has a higher octane rating than hydrocarbon fuels. It also ignites at significantly higher temperatures. Combining ethanol and hydrocarbon fuel will slow the combustion process and decrease the possibility of engine knock. Ethanol poses certain problems for the boating and classic car communities. Ethanol gas is not stable under long-term storage conditions. If you use a full tank within two months or so, you have nothing to worry about. However, the longer the fuel blend sits, the more it separates. Separated fuel can lead to the corrosion of internal fuel system components and eventual failure. If you own a classic car, consider each refueling as a long-term storage situation. Although ethanol-free gasoline can be more expensive in some parts of the country, the fuel can pay for itself in the long run. It’s a good idea to fill your tank at least three-quarters full to help combat the moisture that forms on the uncovered sources. Add a fuel stabilizer halfway through the fill-up process to ensure an even mix and to improve the lifespan of the gasoline in your boat or your classic car. Since 1975, Gold Eagle 104+ has been the original octane booster. This product can help improve the power of the engine, increase acceleration and boost gas mileage. The product also cleans fuel injectors along with the entire fuel system. The 104+ octane booster is safe for catalytic converters and oxygen sensors. Keep in mind that this product is intended for off-road use only. One bottle treats up to 18 gallons of untreated gas and is safe for use with ethanol fuels. Gold Eagle was founded in 1932 by Armin Hirsch and is located in Chicago. For more than 75 years, Gold Eagle has been a pioneer in the production and distribution of aftermarket fluids and additives for automotive engines. The company is also an innovator and leader in product development. Carburetors are responsible for blending the air and fuel for some internal combustion engines. Although most vehicles today use fuel injection instead, carburetors can still be found on certain models and in older cars. As air is pulled down into the carburetor by the intake vacuum, fuel is siphoned from the fuel bowl and mixed with the air to create a combustible mixture. When the engine is idling, the fuel enters the carburetor throat through small idle ports. At higher RPMs, the fuel is pulled through the main metering jets into the narrowest part of the carburetor throat (the venturi). From there, the air/fuel mixture flows through the intake manifold and thus into the engine cylinders where it provides power to the vehicle. When a carburetor is working properly, the engine starts easily, idles smoothly and accelerates without hesitation. Fuel economy and emissions are within limits for the year of the vehicle. There are several problems that are blamed on a “dirty” or “bad” carburetor. These include hard starting, rough idling, rapid idling, stalling, hesitation and poor fuel economy. Because carburetors are expensive to replace and rebuild, you will want to be sure that the carburetor is indeed the problem before tinkering with it. Hard starting can be caused by a choke that fails to close, causing a rich fuel mixture in a cold engine. In this case, a simple adjustment or a cleaning of the choke mechanism and linkage can solve the problem. If the choke spring is broken, the choke will never close. If this happens, your engine may stall if you attempt a cold start. You should be able to solve the cold hard starts with a choke repair kit or a new bi-metal spring. It is not necessary to replace the entire carburetor for this problem. Rough idling is usually caused by a lean fuel mixture that is the result of leaked air between the manifold and the carburetor. This problem can also be caused by a defective purge control valve, weak or broken valve springs or bad plug wires. Stalling is caused by low idle speeds, lean fuel mixtures and malfunctioning ignition. In this case, you may need a new fuel pump, fuel line or fuel filter. You could also have too much water or alcohol in your gasoline. You may need to increase the idle speed to solve this problem. A carbureted engine can also experience engine knock or pinging. If this is true, consider using an octane booster such as Gold Eagle’s 104+ octane boost to help get the problem under control. Carburetors require a certain number of adjustments and tune-ups to ensure that they continue to operate properly. If you cannot take the car in as often as necessary, you may be able to use a higher octane fuel to prevent engine knock. The use of the inexpensive Gumout octane booster will help maximize performance and reduce emissions in your vehicle. The product will also help restore proper combustion, thereby reducing knocks and pinging. Gumout octane booster will not harm oxygen sensors and is safe for use with turbocharged and supercharged vehicles. In some cases, low-octane fuel is the result of outright fraud on the part of the gasoline retailers and distributors. Most states have a department of weights and measures that ensure the correct calibration of gas station pumps. However, most states do not have a way to ensure the octane level of the fuel. As a result, some filling stations may be selling regular octane fuel at mid-range or premium fuel prices. Most gas pumps offer three grades of gasoline: regular (87 octane), a mid-range blend (89 octane) and premium (91 octane). These numbers may vary from state to state depending on the brand, fuel additives and whether the gasoline contains ethanol. Some states go up to 93 octane while others go down to 85. As the octane rating goes up, so does the price of the fuel. Many filling stations mix regular and premium fuel together to create the mid-range grade. However, there have been cases of people who tamper with pumps to change mixture ratios to create a more profitable blend. The most common scam is to fill the “premium” underground tank with a couple hundred gallons of low-octane fuel. This scam is difficult to detect and has been used by unethical distributors on honest fuel retailers. Premium fuel often contains specific cleaning additives that may be beneficial to the engine. Most vehicles are designed for 87 octane fuel with the exception of turbo or supercharged engines. Extra octane should not be required unless the vehicle has heavy deposit buildup or lots of miles. Although engine knock is commonly caused by low-octane fuel, it can also be caused by an overheated engine. Overheating can be caused by low coolant, poor heat conductivity from deposit build-up in the water jackets, poor radiator airflow and a host of other reasons. If the radiator is clogged or blocked in some way, the cooling efficiency will be reduced and cause the engine to run hot. A malfunctioning cooling fan can also cause an overheated engine. If you are certain that the cooling system of your engine is fine but detonation continues, you may need to consider an octane booster such as the Gumout brand. Oxygen sensors in modern vehicles are designed to test the emission levels of the exhaust. If your oxygen sensor is damaged or contaminated in some way, your engine warning light may come on. Catalytic converters are responsible for converting toxic gases and pollutants present in automotive exhaust into less harmful substances. If the catalytic converter is damaged or clogged, your vehicle will not pass the emissions test. Turbo and supercharged engines require higher octane fuels than less powerful engines. Be sure that the octane booster you select is safe for your expensive car. Some octane boosters are designed for off-road use only. Check the package to determine if the product is suitable for your intended application. Should they ever become irreparably damaged, engines are an expensive replacement to make. In most cases, you would be better off simply purchasing a new car. If you have engine knock or pinging, use an octane booster to help preserve the life of your pistons and your cylinders.